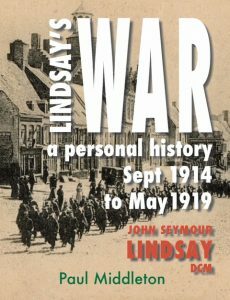 The remarkable story of John Seymour Lindsay’s First World War experiences in 252 pages with 172 photographs and illustrations. “John Seymour Lindsay was my wife’s grandfather who survived 16 months on the Front Line and sent back hundreds of letters detailing the daily life of his unit. The ten chapters deal with the story of Lindsay volunteering to join the London Rifle Brigade, training in London during the autumn of 1914, the journey down to Southampton and the embarkation for France. This is followed by a vivid description of the shock of a winter spent under canvas, more training and the journey up to the Front Line at Ploegsteert. 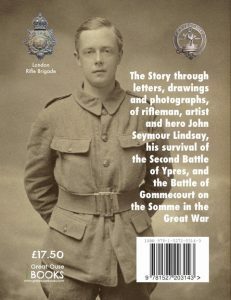 The story continues with his moving description of the Second Battle of Ypres, the death of his best friend in his arms and his removal to hospital. Then follow letters detailing his recuperation, quick marriage in London, and the award of his DCM for conspicuous gallantry. Available from the author at pmiddleton@mac.com only £17.50 including postage and packaging. You can download a free sample chapter at www.greatousebooks.com.